Adjustable Size Vest: Adjustable waist and shoulder system for tailored girth , Fit to Any Adult With Size From S to XL Tactical Vest features two large internal zippered pockets offer additional storage for items such as documents and maps Materials: denier light-weight ballistic polyester, high tensile strength composite polyester thread Mesh webbing designed for ventilation and durability. Tactical Vest features two large internal zippered pockets offer additional storage for items such as documents and maps, plus there's an interior back mesh pocket with a touch-fastener closure. This back mesh pocket is ideal for a user-supplied hydration system that allows an access port for routing a drink tube between layers of the vest to either the right or left shoulder. D-rings, located on either shoulder, can be used for routing and storing of the drink tube and bite valve, or for attaching accessories or a sling harness. Additional features include a padded shoulder, radio/phone pouch, four rifle magazine pouches, and a utility pouch with detachable elastic loops for shotgun shells.fully adjustable to fit most adults, with adjustable shoulder panels and side straps, and ladder buckles on each side of the vest allow for quicker adjustment and a customized fit. 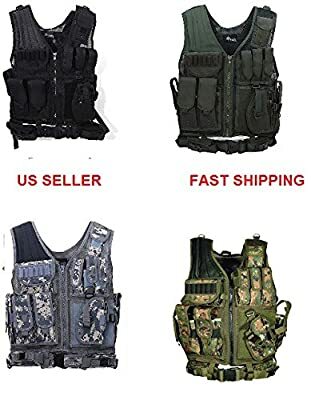 This tactical vest features four rifle mag pouches that can accommodate the standard M4/AR15 30 round magazines, and are adjustable to fit either one or two magazines per pouch. Mesh webbing designed for ventilation and durability, and the 1" heavy duty MOLLE straps allow you to carry additional gear. Front and back touch-fastener areas enable the attachment of patches and IDs. A reinforced rescue pull handle, for dragging injured personnel out of harm's way, is located on the upper back of vest.